Lisa visits her little brother, laid up with a hurt leg in the hospital. He regrets being unable to go to the Wind Festival and begs her to catch him a specific Pokémon there. She agrees, reluctantly. Ash heads towards the festival too in the obviously Fura City. The movie's characters appear in the town also. PokéranChannel, run by a boy in dreadlocks and big glasses, turns on and introduces us to the Wind Festival, and how Lugia sends wind to power the windmill-laden city and visits personally each year at the time of the festival. Kagachi is in town with his niece and sister, telling her about the time he personally put out a big forest fire. His niece, Lily, wants to see his incredibly strong Pokémon and reaches for the Pokeball at his belt, but he says maybe another time. We also briefly meet Torito, a painfully shy researcher who can't imagine speaking in front of people the way Kagachi does, and Hisui, an old woman who can't stand Pokémon being near her. Ash saves Largo from some bullies whom she accidentally bumped into and knocked over their juice stand, and Pikachu beats up their Phanphy. Team Rocket is lurking nearby and thinks to steal Pikachu, but decides to open a juice stand instead. Ash is shown the "holy fire", a light atop a tower that shows Lugia where to direct wind. He can also see an old abandoned electric plant up in the mountains. Lisa bumps into Kagachi and his family, and when they find out she's after a Pokémon, Lily says her uncle is an amazing Pokémon trainer and can help. Kagachi nervously looks at the photo of the Pokémon she wants to catch, and directs her the mountains. Delighted, she makes her way up. Festival goers prepare for the "Get Race", a game where trainers are given special Pokeballs to see who can catch the most of the specially designated Pokémon around town. Lily is so excited to see her brilliant uncle win the competition, making him nervous. Torito, meanwhile, is panicking in his lab over a presentation he has to do in front of many people. Hisui visits him and seems compassionate to the shy young man, but bumps into a flask on her way out and breaks it, as Kagachi bursts in to also speak to Torito. Largo is up at an abandoned building in the mountains, and leaves food for someone, or something, whom she thanks again for saving her life and apologizes that whomever it was was injured in the process. Team Rocket has opened a juice stand successfully. Torito and Kagachi have come to an agreement -- Kagachi will do Torito's presentation for him, if Torito helps him win the Get Race. With a secret earpiece in, he is directed to each Pokémon by Torito and stays in the lead. He wastes valuable time saving a Sudowoodo from a bullying Golduck -- but the terrified Sudowoodo is in awe and grateful. As the Get Race progresses, a Tyranitar has become entangled in twine and is being choked. It smashes its way around town, but only Ash notices the twin choking it and gives up his potential victory to chase the suffering Pokémon. He and Pikachu are caught on camera as the Get Race commentator follows their rescue efforts, and the moment they free Tyranitar (using Iron Tail to cut the twine) is broadcast to all watchers, who cheer for Ash's compassion and bravery. Kagachi wins first place, and Ash wins second. The mayor, Largo's father, congratulates them, but Largo becomes upset when Kagachi loudly tells everyone watching that there is a rare Pokémon around here. The proclamation is broadcast all over, and even the dreadlocked host of PokéranChannel does a special report on the supposedly rare Pokémon. At the end of the day, to her incredibly discomfort, Hisui is being followed around by Pokémon. Kagachi is also being followed -- by Sudowoodo. Largo eats dinner with her father, and nervously mentions the rare Pokémon, and Zeraora. The mayor immediatly turns cold and tells her not to speak of Zeraora, who cursed their whole town. Lisa is in the mountains, becoming increasingly bedraggled and unable to find her Pokémon. Guards tell her to turn back and that the mountain is forbidden, and the Pokémon she's looking -- Eevee -- isn't even there. She realizes she's been lied to. Hisui is still being followed -- and Pokémon have infiltrated her house. She opts to sleep on the porch to avoid them. Torito is also being followed... by Team Rocket. The next day, Ash and Pikachu help Lisa catch an Eevee. She has obviously never dealt with Pokémon before, and Ash coaches her through the process of using Pikachu to battle it, and the Eevee is successfully caught. The two sit down to talk as Pikachu and Eevee play, and she tells Ash she never had time to train Pokémon as she was a track star until an injury cut her career short. Ash believes in her being able to run again one day soon. Hisui visits Torito to ask for help with the Pokémon following her, of which number six or so now. Torito thinks when she bumped into the vial the other day she got Sweet Scent on her, and now they will continue to follow her much to her dismay. The festival has been disrupted by rocks in the trolly car rails, and various other sabotages. While everyone mills around, Lisa spots Kagaki and storms up to him to demand to know why he lied. He begs her not to do this in front of his niece, and she relents and instead gives him credit for the Eevee she caught, which makes Lily happy and proud. The mayor asks for Ash and Kagaki, the winner and runner up of the Get Race, to help in the cleanup efforts, which they do alongside Lisa and many others. Kagaki is nervous knowing the presentation he offered to help with is soon. Many people are suspicious that Zeraora's curse befell the festival. Torito is forced to begin the presentation without help as the festival resumes but Kagaki is still not there. He stands in front of the crowd and can barely get a word out, stuttering and whimpering out only a few words as everyone and his fellow researchers look on in confusion. Kagaki runs to help, followed by the others as Lisa exclaims how suspicious he is acting, but sees it already began and he is too late. Torito tries to play his research footage but instead begins to play a recording he made of himself helping Kagaki cheat in the Get Race. He is too mortified to even shut it off in time before everyone can clearly see what happened. Kagaki is faced on all sides by people looking at him accusingly, and his Pokeball falls to the ground and opens: empty. Lily begins to cry realizing her great and amazing uncle has been lying to her all along. Team Rocket sneaks into the lab and causes chaos and an explosion. Lily faints, and Kagaki panics, explaining how weak she is. Ash chases Team Rocket as long as he can, but loses them. In the scuffle, Eevee is hurt, and Lisa blames herself for not being fast enough. Torito sadly blames himself. Hisui bitterly screams at the Pokémon following her to get away, and Kagaki, who realizes Sudowoodo is still following, also walks off on his own after telling it to get lost, and he'll never tell another lie again. Team Rocket has already lost whatever mysterious substance they stole from the lab, each thinking they handed it to the other. It lies abandoned in the forest. The next day, disaster strikes. The holy light is missing from the tower and the wind has completely stopped. PokéranChannel reports on it. Lugia doesn't have direction for where to send wind. Torito overhears his fellow researchers talking about what a mess he made, and he leaves the lab sadly with his Chansey in tow, too soon to hear one of his lab mates defending him as caring more about Pokémon than anyone else. Meanwhile, everyone tries to figure out who stole the holy fire, and Torito joins the mayor, Ash, Lisa and others. Pikachu and Eevee trace a scent to a Smeargle, and Torito realizes whoever stole the line also stole Smeargle Ink from his lab, as it had gone missing recently. They follow the invisible ink footprints into the mountain, and find Largo, who is the culprit, much to her father's shock. She has been attacked by poachers who were after her Teddiursa and Ditto, and the Pokémon she was leaving food for, Zeraora, attacks them and is again badly injured in the process. The group arrests them as soon as they arrive, but Largo has to explain that she stole the light to stop the festival so everyone would stop thinking about catching the rare Pokémon Kagaki mentioned. She cries as she tells how Zeraora saved her life, and she only wanted to protect it. Her father, who was angry at first, kneels down and begins to tell the truth about Zeraora's curse. He says Zeraora hates humans, because when a huge forest fire devastated the mountain, they ran and abandoned Pokémon to die in the flames. Zeraora saved as many as it could, but began to feel bitter and angry. After the fire, humans knew Zeraora existed, and crowded the forest all trying to capture it, only increasing its fury. The mayor created the idea of the curse and forbade entry to the forest so Zeraora could finally live alone in peace and solitude. As he tells his story, the disaster of the stalled wind increases a hundredfold as the mysterious bottle Team Rocket stole from the lab, explodes, and a paralyzing, choking cloud of Hoshi no Yakuzai begins to spread, with no wind to dissipate it. It begins to swallow the town as Torito watches in horror, guilty as it is a substance he was studying. Kagaki is worried as Lily is still weak and could die if caught up in the cloud, which she is, her and her mother stuck in a gondola. The group thinks up a plan as Ash tells them all to use their Pokémon Power to be strong. Torito will create an antidote to the paralyzing smoke. Hisui will power up the old electric plant, which features a giant windmill -- she can do this, as she built it in her youth and knows how it operates. Kagaki goes with Torito, and on the way, Sudowoodo hands Kagaki the empty Pokeball he once paraded around - and asks to be caught by him so they can be partners. Kagaki agrees tearfully and captures Sudowoodo. Torito arrives at the lab and faces all his lab mates who were talking him down, and finds his strength (Pokémon Power) to loudly declare they have to work with him, even if they hate him, to save all the people and Pokémon (who are taking refuge as best they can inside buildings). The lab mates agree and they all make up and begin to create the antidote. Zeraora is suffering from nightmares before suddenly waking up surrounded by unfamiliar humans and lashing out. As they struggle with Zeraora, fire breaks out in the forest, caused by the smoke. Ash tells Lisa she must run and deliver the Holy Light back to the tower, so Lugia can send wind to help the entire situation. She is worried and unsure, but Eevee, who's leg is also hurt, looks determined to try, and begins dragging the huge heavy light, giving her strength (her Pokémon Power!). She takes off her shoes, stretches out and then begins to sprint to the tower. Power begins to go out and the antidote is ruined at the lab. Torito begins to panic before noticing Team Rocket nearby with their juice cart-- their juice being made from Lum Berries. He takes their Lum Berries with his newfound Pokémon Power strength to begin a new antidote. Hisui, back with the group in the forest, realizes they can wait no longer for Torito and have to begin to get the plant up and running. She flashes back to the last time she was there -- trying to get people and Pokémon out as fire engulfed the building. The key that ran the plant was forgotten, and her beloved Snubbull retrieved it, but was burned alive in the attempt. She still wears a glove on her hand that was burned reaching to try to save it. 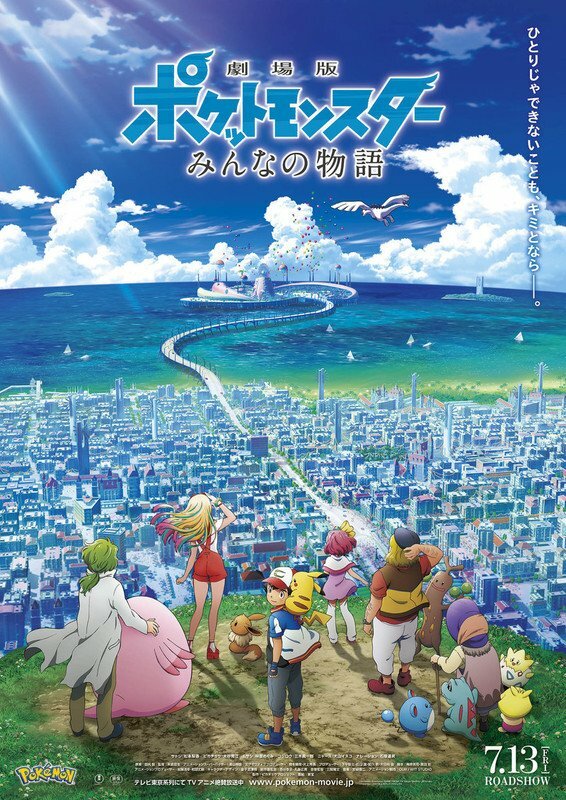 After a vision of the ghost of her Snubbull patting her for encouragement, she accepts help from her pack of followers and the Pokémon begin to clear a path to the plant for her and Kagaki, who goes with Hisui now. Lisa feels lost as she keeps heading for the tower, but her little brother calls her and mysteriously knows where she is on the map, directing her on the right path. She is suspicious but accepts the help. Zeraora is busy saving Pokémon from the fire, while Ash helps the effort and at the same time reasons with Zeraora that not all people are bad, and how much they all want to help. Zeraora looks at Largo, and knows it's true, but is still not convinced to trust. Torito has completed the antidote! Kagaki and Hisui are at the old plant, and Hisui attempts to power it up while Kagaki and the Pokémon push the mechanism to try to get the generator started. Ash continues to fight with Zeraora as it refuses to trust or work with humans. One of Zeraora's lighting blasts goes awry, and Ash steps in front of it to save Pokémon, taking the brunt of the attack and collapsing. He is okay, but Zeraora begins to trust him even more, seeing his sacrifice. Torito arrives with the antidote, which needs to be thrown up into the giant windmill-like propeller so it can spread through the town. Kagaki says he can do it, and they trust him despite his previous tall tales. With Sudowoodo's help, the antidote is thrown into the propeller and begins to spread through the town, undoing the choking and paralyzing effects of the smoke. Their plan worked! Torito and Kagaki rejoice until Hisui reminds them it's not over yet. Zeraora fights the fire alongside the mayor and the townspeople and Ash. As they work together, Zeraora begins to trust more and more. Electric Pokémon are enlisted to get power working so the sprinkler systems can be turned on. As the fire rages, the sprinkles do turn on but a part of the building they are saving Pokémon and people in breaks and threatens to crush Largo. Ash and her father dive to save her, but Zeraora is the one who makes it first, holding up the heavy crushing metal all on its own. As the townspeople cheer for and encourage the struggling Zeraora, it uses incredible strength to put the spire back in place. It collapses and falls, but Mareep and Flaffy and other cottony Pokémon spray cotton so it has a soft landing. Lisa has succeeded in climbing the tower and restoring the Holy Fire. Lugia appears before her, and brings rain and wind to the town, putting out the fire once and for all and blowing away any residual smoke. Everyone is delighted to watch Lugia fly over them on the chaotic but successful last day of the festival. Largo comments that once again, they were all saved by Lugia and Zeraora, but Hisui remarks that this time they were saved by everyone. In the end, the Mayor announces to all that Zeraora is no longer a curse, and never was, that the story was never true and Zeraora was always a good Pokémon. Zeraora is now is respected and loved and leaving peacefully and amicably in the mountains nearby, with Pokémon and human friends, including Largo. Kagachi makes up with his niece, who forgives him and is feeling better. Torito has a newfound confidence in front of people, and Hisui accepts Pokémon back into her life. Lisa goes back to her little brother, revealed to be the dreadlocked host of PokéranChannel. Ash and Pikachu journey on.